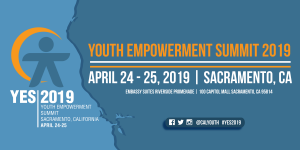 The California Coalition for Youth will host the two-day Youth Empowerment Summit (YES) on April 24th through the 25th at the Embassy Suites Riverside Promenade. YES 2019 will teach formerly foster, runaway, and homeless transition-age youth on how to become change leaders in their communities and youth leaders on youth issues. Through the various workshops and meetings with California representatives at the State Capitol, YES participants will get firsthand experience in creating positive change in their communities and advocate for youth at the legislative level. YES will feature an array of speakers, throughout the YES program, ranging from California State Senators, Members of California’s Assembly, to Youth Advocates and presenters from various levels of expertise and service organizations. The Coalition’s annual Youth Conference (currently known as the Youth Empowerment Summit) has brought youth and youth advocates to the State Capitol for more than 20 years to teach, inspire and become advocates for positive change. At least 50 percent of YES participants are youth from all across California, many of whom are accessing community services, living in transitional housing or shelters and/or are a part of a youth development program. Join our mailing list, and be alerted with all of the upcoming news about the Youth Empowerment Summit today by emailing, CCY External Affairs Manager, Jason Alviar at jason@calyouth.org. Anyone Passionate About Empowering and Improving the Lives of Youth! A: It is! Please reach out to Jason Alviar, at Jason@calyouth.org or 916 514-4464 x103 to do so. Q: Is it ok if the name on my ticket or registration doesn’t match the person who attends? Q: What Hotel/Accommodations are Available? Q: Is there a workshop list available online?